India is a vast country with complexities that do not lend themselves to easy fixes or simple adaptations of what might work elsewhere. All aspects of development in urban India are constrained by the poor cumulative quality of its urban infrastructure. This is compounded by urbanization rates that are too fast for existing systems to keep up. We know water issues severely affect the environment, citizens and the economy as a whole. Despite over exploitation of groundwater, deteriorating water quality, and weak water governance, there is a cause for optimism as the public and business sectors now acknowledge these threats to India’s economic growth and public health. These increasingly constrained conditions reduce individual’s quality of life and add up to huge economic losses to citizens, their cities and their communities. Current Water related facts and figures depict that the costs differential per type of connection and type of access is extremely wide. For 500 liters of water a public water connection costs $1/day (Rs. 61) , a private connection costs $3 (Rs.183), a private tanker supplying slums costs $60 (Rs. 3664) for 500 liters (i.e. 60-70 times the cost of a public water connection). There are several reasons for this disparity. Also metropolitan Delhi (22 million people) is compelled to receive regional water from increasingly further and dedicated sources. Most of its major sources are now between 320 and 200 kms away. There are huge gaps in management also. There are only 17 sewage treatment plants serving a population of 20 million. Most of the city’s raw sewage flows into the Yamuna river (the city’s only river). Above issues reflect just a small portion of the underlying complexity of providing water to a metropolis of 22 million people. Since radical and different approaches are required, this is a good opportunity to re-imagine, rethink and restructure a more resilient and scalable water system. If conceived in a pre-emptive way, new urban development could conceivably be better positioned than current areas that are harder to retrofit. 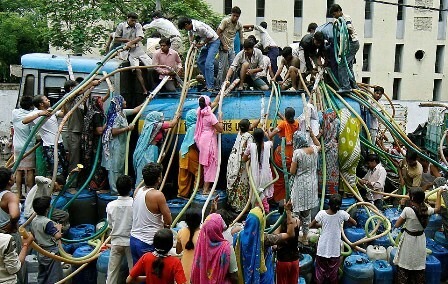 The growth of per capita water consumption in urban India has accelerated in cities as a consequence of improving living standards, increasing rates of urban population, industry and surrounding agricultural demands and the need to overcome increasing climate change impacts. These continuing conditions are likely to mean that the demand for water will continue to outstrip demand for the foreseeable future. Also on the positive side, India is a country of great entrepreneurial spirit. Inadequacies and need are quickly seen as opportunities that tend to generate many quick and often clever initiatives. A number of innovative approaches to improve water supply and sanitation have been tested in India, particularly in the early 2000s. These include community-led total sanitation, demand-driven approaches in rural water supply, a public-private partnership to improve the continuity of urban water supply in Karnataka, and the use of micro-credit to women in order to improve access to water. This means that the potential for better water options does exist. The bigger challenge is that many current and future need driven innovations and services may be financially unsustainable, unable to be scaled up, and will become poor substitutes for the benefits that may be better obtained from coordinated, integrated and consistently uniform (i.e. predictable and reliable) infrastructure. TARAgram Yatra 2014 will undertake an Expert Round Table of largely Indian experts on urban water. This round table will involve a set of important stakeholders to work towards quality and sustainability, affordability and access, and Infrastructure and system efficiency, by understanding and analyzing these constraints and opportunities, and focusing on the emerging solutions (by different stakeholders at different levels and locations). The water round table is supported by IFHP and is contributing to the TARAgram Yatra process. This effort is part of a broader initiative aimed at engaging Indian cities in new and productive ways to improve its urban conditions.